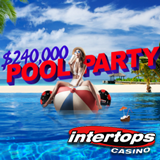 Intertops Casino players can beat the heat this summer by coming to its $240,000 Pool Party casino bonus event! Every week until Labor Day, the world's most trusted casino will give $30,000 in casino bonuses to frequent players. There will also be weekly random draws for another $5000 that even occasional players can win. One lucky pool partier will make a really big splash by winning a $1000 cash prize at the end of the party. Anyone can win weekly random draws for $5000 in casino bonuses. All players that have made it to the top twenty during any week of the promotion are eligible for a $1000 prize to be awarded September 5th. This is a cash prize, not a bonus, and therefore has no wagering requirements. Pool Party bonus details and current scoreboard rankings are available at http://casinopromotions.intertops.eu/party. Later this month Intertops Casino will commemorate the Year of the Rooster by introducing a new Chinese-themed slot called Kung Fu Rooster. Its Rooster symbol is Wild and doubles any win it is part of and its Monkey Scatter symbol can trigger up to 25 free spins where the multiplier increases with each free spins win. Kung Fu Rooster will soon be in Intertops Casino’s download, instant play and mobile casino. Intertops Casino, one of the world’s oldest and most trusted online casinos, offers hundreds of real money casino games from Realtime Gaming. Its newest and most popular slots are available in its new mobile casino for smartphones and tablets as well as its download and instant play casinos for desktop computers and laptops.